I love farmhouse decor and I’m so excited about its current popularity. I was raised in a home full of antiques, so anytime I see farmhouse or cottage decor, it is like coming home for me. A lot of farmhouse and country elements we see today originated in European countries like Ireland. Let’s look at some of those elements. 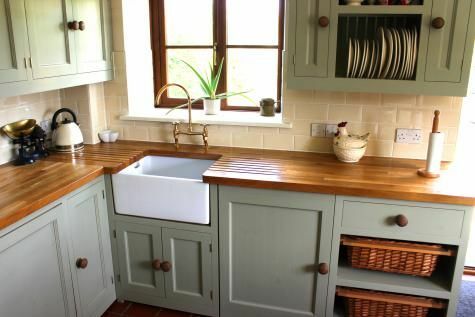 In a lot of Irish inspired homes, we see the farmhouse sink like the one above. We also often see a lot of natural elements: wood, iron, stone, brick, and plant life. Wood is obviously present in most all home, but in the case of the Irish cottage or farmhouse, we see very heavy and thick wood and wood with a very rustic or even old look. For example, in the above photo, we have the butcher block counter top. Wood elements are also seen quite often elsewhere in the home. Wooden ceiling beams are a popular feature, especially in kitchens and living areas. Other rustic wood elements to consider include shelving, a mantle, and kitchen table. 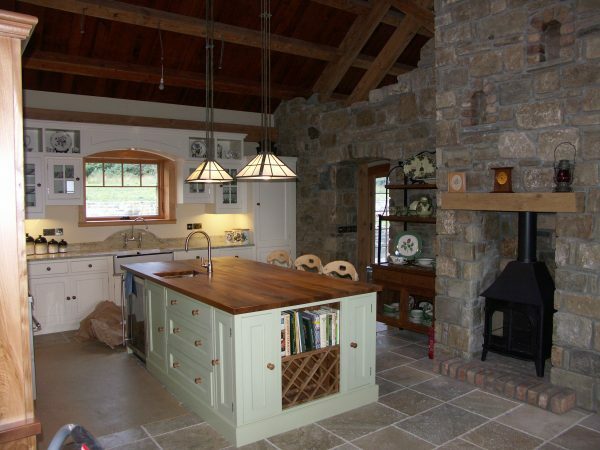 Stone is another example of a natural element that is seen quite a lot in Irish cottages. This looks very rustic, sturdy, and classic looking. You’ll often see the stone and brick around a fire place or an iron woodburning stove, as shown here. Another natural element is plants. Whether you use fresh cut flowers and house plants or faux plants, a lot of green green throughout the home breathes life in to the home and makes it more homey with a country appeal. To continue the Irish cottage look in your bedroom, you can start with a metal bed. 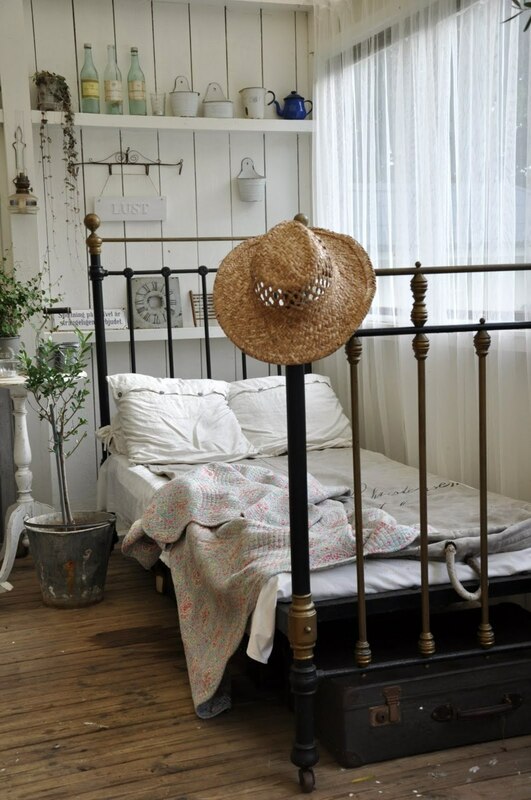 Brass and iron beds are very sturdy and have a modern rustic appeal. To continue the Irish Cottage theme, add a heavy throw or homemade quilt. Homemade quilts are very shabby chic. A lot of old quilts are setting around in people’s attics just crying out to be used, but you can also find a lot of brand new store bought quilts with the same classic appeal. For other home decor, visit your local antique shop or flea market. Add classic but simple elements like glass bottles and jars, antique oil lamps and whiskey jugs, and old iron, porcelain, or enamel wear pieces. The folks at Chill specialize in home insurance and they have an ebook on Ultimate Irish Homes. Check it out for more great ideas.